It appears there was a small chunk of warm water just below the surface that the recent TW burst must have forced up. The warming should be very short lived. No doubt I'm surprised by it though. 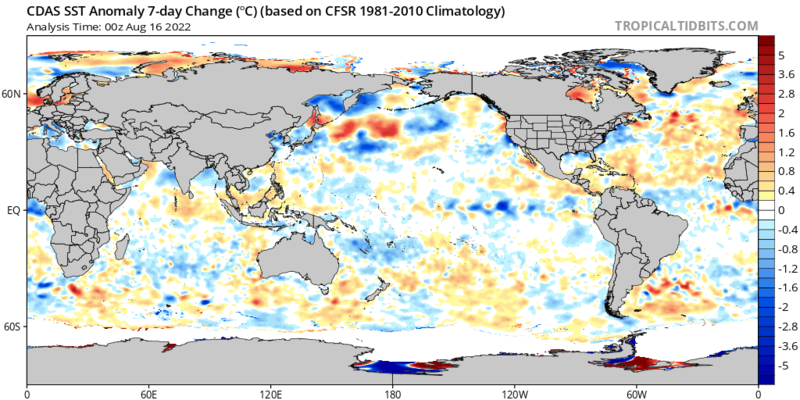 I'm not sure about that, because the subsurface waters are colder than the surface waters (even during Niños), and are certainly colder now. I'm thinking it might have something to do with the oceanic rossby wave packet sandwiched to the N/S of the equatorial waters, but that's just a guess and I could be wrong. That is a good point. When I was looking at the subsurface map it showed a small chunk of anomalous warm water, but it still could have actually been cooler than anything on the surface. 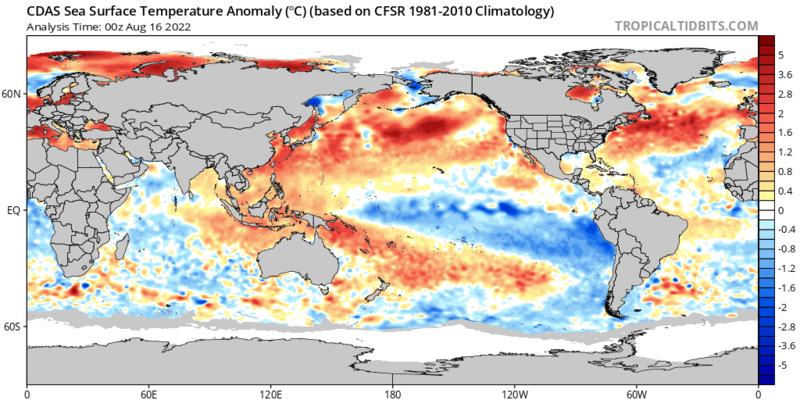 Yeah, the shallow "warm anomaly bubble" that just popped up below the surface (probably) indicates a lack of upwelling in that region, hence the warming SSTs. The question is, what's inhibiting the upwelling? My guess is the recent and ongoing trade wind burst will change things soon enough. I'm betting Nino 3.4 will be -1.0 within a couple of weeks. Its been warming considerably over the last week. You have been saying 'soon enough' for a long time and its not happening. Still like the prospects for this winter though. It is interesting looking at the 7 day change map. It appears the areas north and south of the ENSO region have dropped in the Central and Eastern Pacific. The warm water that has been built up over those areas may have collapsed into the ENSO regions thus causing the rapid warming. It's also noteworthy Nino 1+2 and part of 3 have dropped. Through those cold ENSO analogues out the window. Are there any good articles out there explaining what's causing the warming in the ENSO region? Probably a question only Phil would know the answer to. I have no idea..maybe some sort of inertial ocean-based wave? Perhaps a minor KW or ORW? Velocity Potential is reflective of Niña forcing, so the only explanation I can think of (that works) is something of a fluid-mechanical nature. One thing for sure is it doesn't mean a Nino is coming. The atmosphere has been very Ninaish. My theory is the warm water that had been hanging out just N and S of the ENSO area flooded into the 5N to 5S region. It could mean the Nina will cover a wider belt after this is over. This is jumping the gun just a bit, IMO. Nah. It will turn cold again very soon. It's the only place that warm water could have come from. The subsurface is cold, the trade winds have been above normal, and the atmosphere has been in a full blown Nina mode. The one thing has struck me about the Nina is how narrow the strip of cold anoms have been and how warm it's been just N and S of the 5N to 5S belt. It was mostly a joke. The -0.5 to -0.8 that I was originally thinking might be a little hopeful now though. This is certainly weird. I've never seen it behave like this. The SOI has skyrocketed in the last few weeks and now the SST's shoot up like we're going into a Nino. This cold event has featured quick hitting warm spikes from the beginning though. What would you do if we actually go into a Nino? I'm not worried about it though. Essentially impossible given the context and the current subsurface profile. Ironically the CFS has trended considerably colder for Nino 3.4 for the early part of the winter in recent days. I still say -0.5 to -1.0 for December. Throw climo out the window, guys! Ho hum. 3.4 is up to +0.42C today. Though, it looks like it's about to level off and then hopefully start dropping soon. My bet is it will crash. I think what is potentially important is that the feeder regions, the areas along the coast north and south of the nino region, are both cooling off with time. That is a good sign for eventually cooling off the SSTAs in 3.4 as that water will eventually move into the area. I would imagine those water are normally cooler than average during ninas. I agree. That kind of dovetails with my theory of why Nino 3.4 rose so dramatically when it really shouldn't have. The trade winds do cause upwelling along the equator but without the cool water in the feeder regions you tend to have limited cooling potential, or in other words, what we have seen up to this point. The cooling is restricted to a few degrees north or south of the equator. But now with those feeder regions cooling off it should allow for a more robust cooling if the strong easterlies can continue, and to a much greater N/S potential. It makes a v shape which is widest near the Americas. Really looking like a weak Nino in the eastern half of the ENSO region... more so in the last couple weeks. This is currently a west-based Nina, which is better for us anyways. Official CPC weeklies show 3.4 up to a -0.4c anomaly. 1.2 in the eastern Pacific is at +0.8c. Looking like a pretty neutral ENSO setup. It will be interesting to see where winter ends up. I'm still thinking weak Nina. 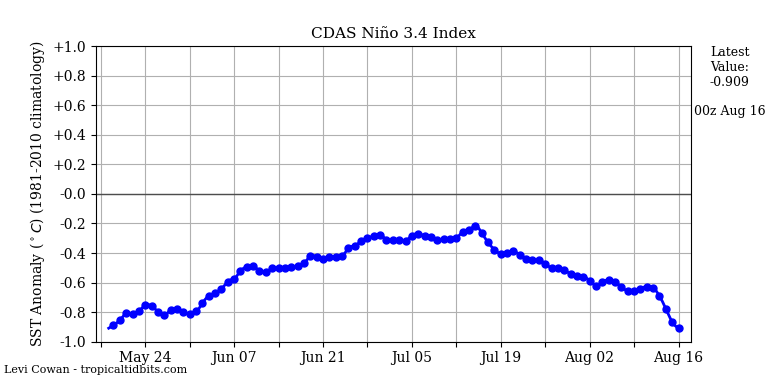 Nino 3.4 began to fall again today. Somewhat interesting that despite the recent warming, the CFSv2 has been steadily trending colder for Nov-Jan over the past week or so. Interesting, but I thought the CFSv2 was garbage at predicting ENSO. Unless it's showing something we want to see, of course. Pretty much agrees with us here: more opportunities for cold snaps this season than recent winters. A bunch of the analogs they're using don't make sense to me. I see a bunch of moderate to strong Niños, and even a greater quantity of -QBOs. Check that Phil. The years on the analog maps are for the end of winter (Jan-Feb), not Dec....so, their years look to be mostly cool ENSO. I was just going to mention the CFS trend on ENSO. Positive we probably don't want it to go strong anyway, but a solidly weak Nina would be good. Got me. Was looking at the US grid plots earlier where DJF averages require the first year to be inputted. As expected Nino 3.4 is falling like a rock now. Haha, what the heck? Expanding Hadley Cells have changed the WHEM U/V wind ratio and temperature profile by under 5%, or within one standard deviation on a yearly resolution. Insignificant, and has nothing to do with the Arctic. What you think of this silly article? Claims west coast will have warm winters rest of the century, while the east coasts basks in cold & snow. I swear Joe Bastardized wrote this! He is probably the worst offender when it comes to being a homie. In actuality we are due for the pendulum to swing toward colder winters in the West. I would never go so far as to say it will be cold in the West until the end of time though. You sure about that? Last winter was an eastern blowtorch, and 2014/15 was also a torch until February/March. Also, 2012/13, and 2011/12 were both eastern blowtorches, along with 2005/06, 2006/07, 2007/08, and most of 2008/09. I think we're more due than you guys. Are you serious? 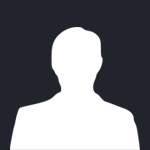 After 2013-14 and 2014-15. I remember hearing endless stories about Niagara Falls being frozen, coldest winter on record for the upper Midwest, etc. What about the record warmth in 2011/12 and 2015/16? December in particular has been ridiculously warm in the east since 2011. Literally five consecutive torches. The east has had some historically cold winters in the last five years. Yeah, it's actually been a nasty stretch here, outside 2013/14 and 2014/15. Blowtorch for five consecutive Decembers, two of our five warmest winters on record, four of our seven hottest summers on record, etc. Snowfall is another story, but that's 90% storm track and luck...any storm that tracks to our south during Jan/Feb will produce snowfall here. Sometimes our coldest winters are the least snowy.